Former University of Texas System Chancellor Bill McRaven was the third highest paid. Texas A&M University System Chancellor John Sharp ranked fifth. The chancellors of Texas’ largest university systems were among the top five highest-paid public university leaders last year, according to a national survey conducted by the Chronicle of Higher Education. The former chancellor of the University of Texas System, Bill McRaven, and John Sharp, chancellor of the Texas A&M University System, earned a respective $1,500,140 and $1,285,147 in combined base pay, bonuses and other financial benefits in the 2017 fiscal year. McRaven, who stepped down in May, was the third highest-paid leader in the Chronicle’s annual report. Sharp was the fifth. The heads of the University of Louisville, Auburn University and Temple University were also among the top five highest-paid, with former Louisville President James Ramsey topping the list with $4,290,232 in compensation. Ramsey, who left the school less than a month into the fiscal year, received the bulk of his pay from a $3.55 million deferred payout and $687,683 in severance. Michael Young, president of Texas A&M University, who earned $1,000,000. Renu Khator, chancellor of the University of Houston System and president of the University of Houston, who earned $913,351. Greg Fenves, president of the University of Texas at Austin, who earned $762,220. Fenves turned down a salary offer of $1 million when he was hired in 2015. Lee Jackson, former chancellor of the University of North Texas System, who earned $750,838. Brian McCall, chancellor of the Texas State University System, who earned $746,000. Robert Duncan, chancellor of the Texas Tech University System, who earned $716,583. Karen Adler, a spokesperson for the UT System, said in a statement that the "chancellor’s salary is funded entirely through private contributions," and that their board of regents "strives to be as competitive as possible when recruiting leadership." The average pay among public college leaders surveyed was around $560,000 — five percent more than the year before, the Chronicle found — and 12 earned $1 million or more. The Chronicle surveyed 220 public colleges and university systems for the report; the highest-paid Texas executives were around the median of public college leaders in terms of their pay compared to their institution’s total expenses. "Generally, there’s always a pressure pushing wages upward for executives," said Dan Bauman, a data reporter at the Chronicle who compiled the report. "Cost-of-living obviously plays a role. Additionally, for executives, those who negotiate with boards of trustees tell us those trustees feel they need to meet certain wage demands to remain competitive." 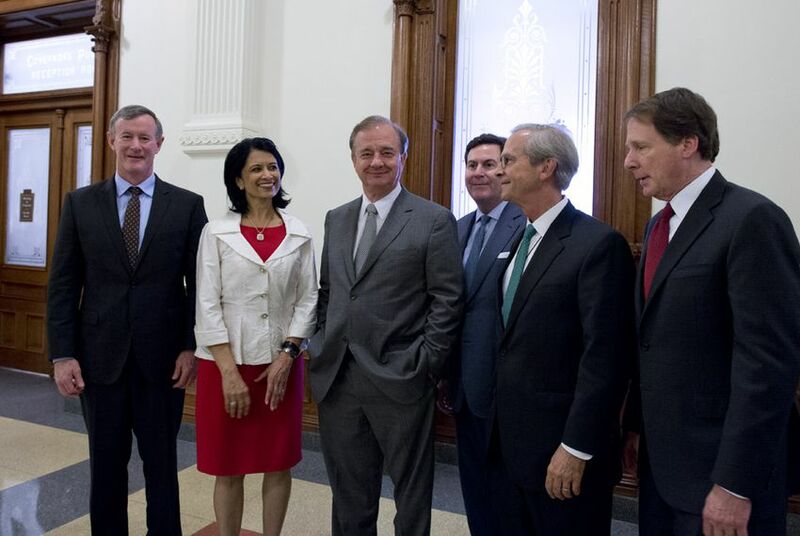 McRaven, Sharp, Young and Fenves’ compensation held relatively constant from the 2016 fiscal year; McRaven’s pay ticked up by $140 — longevity pay, according to the Chronicle — and Young’s remained unchanged. But Jackson and McCall both saw their total compensation rise by about $16,000; Duncan’s increased $30,000; and Khator received a $62,000 pay bump on fiscal year 2016, largely stemming from an added $50,000 in bonus pay. Bauman, speaking about national trends he observed, said that "bonuses may reflect certain institutional goals being met, like a successful giving campaign, or a carrot to keep a president from taking a job at another university." On the other hand, severances "come up when an institution wants to get rid of someone and is willing to pay a price to avoid legal liability. And to keep presidents long-term, boards use deferred compensation packages to entice CEOs to stay with an institution – thereby providing it stability and consistent vision." Texas university leaders saw their pay climb quickly between 2012 and 2016, increasing about 70 percent for the state’s chancellors and for presidents of its flagship schools. At the time, the rising compensation was criticized by lawmakers, but deemed necessary and justified by governor-appointed regents who oversee the university systems and are in charge of setting and approving pay rates. “We believe Chancellor McRaven is worth the investment and that the people of Texas will benefit from his time at the UT System for generations to come," the then-chairman of the UT System’s board of regents said in 2016. The chairman of the University of Houston System's governing board wrote the same year that Khator's salary "is appropriate based on her stellar track record," and her dual role as a president and the chancellor of a system that’s budget now tops $2 billion. The Chronicle’s analysis also notes benefits a chancellor or president receives, including retirement, house, car, personal services and social club perks. McCall and Khator were the only Texas chancellors who received benefits associated with all of those categories as part of their total compensation. McRaven had access to a house and personal services; Sharp a house; and Duncan a house, car and entry to a social club. Though above the national average, the pay of some Texas university presidents was far outmatched by the compensation doled out to their football coaches. Not including financial perks, for example, Khator’s base salary of $704,983 and her $200,000 bonus is about $300,000 less than what was paid to the University of Houston’s head football coach in the 2017 fiscal year, Major Applewhite. Young was paid about one-quarter the salary of Texas A&M University’s football coach at the time, Kevin Sumlin, and Fenves earned less than one-seventh of then-head coach Charlie Strong’s pay. Disclosure: The University of Texas System, University of Texas at Austin, Texas A&M University, Texas A&M University System, University of Houston, University of North Texas, Texas State University System and Texas Tech University have been financial supporters of The Texas Tribune, a nonprofit, nonpartisan news organization that is funded in part by donations from members, foundations and corporate sponsors. Financial supporters play no role in the Tribune's journalism. Find a complete list of them here.